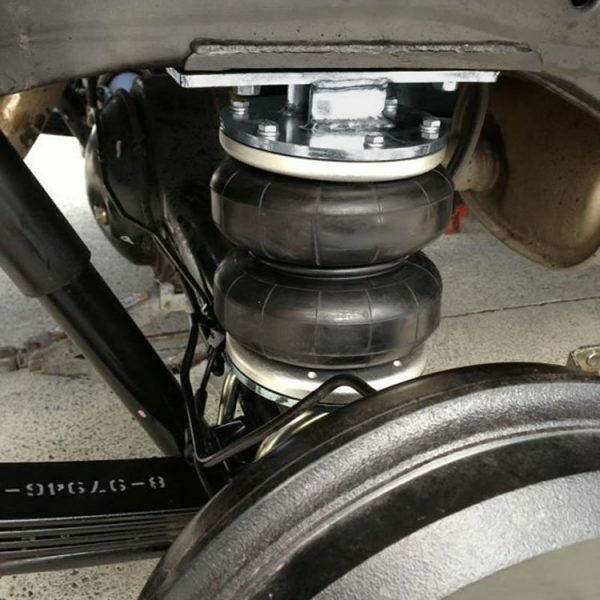 ‘Thor Air Suspension’ makes the Australian Made Boss Style Air Bag Suspension Kits. These are the new standard in affordable Air Suspension. This load assist product gives leaf sprung vehicles an air adjustable rear suspension. These Airbag Kits simply bolt on and when filled with air, raises the rear end (when under load) to make the vehicle level again. This makes the vehicle safer when loaded by keeping the front wheels in contact with the road, eliminating sway and improving cornering (wet or dry). These kits include separate air lines for each side with valves for ease of inflation/deflation. They are tested to ADR standards. Thor Air Bellows are rated to 2.2 tonnes which is well in excess of that required by manufacturers /authorities. Proven in the tough Australian Outback by Farmers, 4WD tour operators and 4WD enthusiasts, as well as the Agricultural, Mining and Film & Television Industries, these kits have a wide variety of uses, the limit is your imagination. These brackets are Laser Cut, not stamped, each bracket is Mig welded and zinc plated in a silver finish to ensure long lasting rust protection. Our brackets have been tested by a Government Accredited Certifier to 51kn, that’s just over 5.11 tonne! Our brackets don’t bend or break like other brands. We purchase our airline and fittings from Australian Owned Companies to help keep the dollar in Australia. These are imported / not made in Australia, (as we don’t have the technology available here). These double convoluted bellows feature heavy duty 5mm thick corded/ribbed rubber similar to the sidewall of a car or 4WD tyre, which have a travel rate of 5.5 inches. This gives a better ride than single convolute by having more flex. Our bellows have been tested by an accredited Government Certifier, and have been tested to 464psi without bursting. 4WD World has over 40 years’ experience in the 4WD business and we will continue to honour product warranties and provide quality and accurate customer assistance.